In this blog post I will show how you can trigger the Azure AD Connect Sync Scheduler with an Azure Automation Runbook PowerShell Script. Since the Azure AD Connect build 1.1.105.0 was released February 2016, a new scheduler is built-in that per default sync every 30 minutes (previously 3 hours). For more detail on Azure AD Connect Sync Scheduler, see https://azure.microsoft.com/en-us/documentation/articles/active-directory-aadconnectsync-feature-scheduler/. Normally a sync schedule of 30 minutes is sufficient for most use, but sometimes you will need to do an immediate sync. 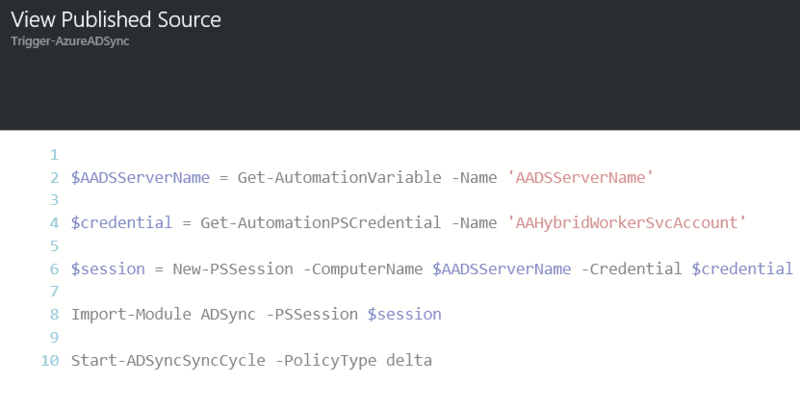 So I thought it was a good idea to create a PowerShell script that creates a remote session to the Azure AD Connect Server, and then triggers a delta sync. Now, this PowerShell script can of course be used with any of your favorite automation solutions, for example Orchestrator or SMA on-premises. But why not just use Azure Automation and a Hybrid Worker to run this script. This way you can trigger the script in a number of ways including in the Azure Portal, via Webhooks, remediating alerts in OMS and more. You will have to have an Azure Subscription, so that an Azure Automation Account can be created (or use your existing account), and that a runbook script with the related assets can be created. 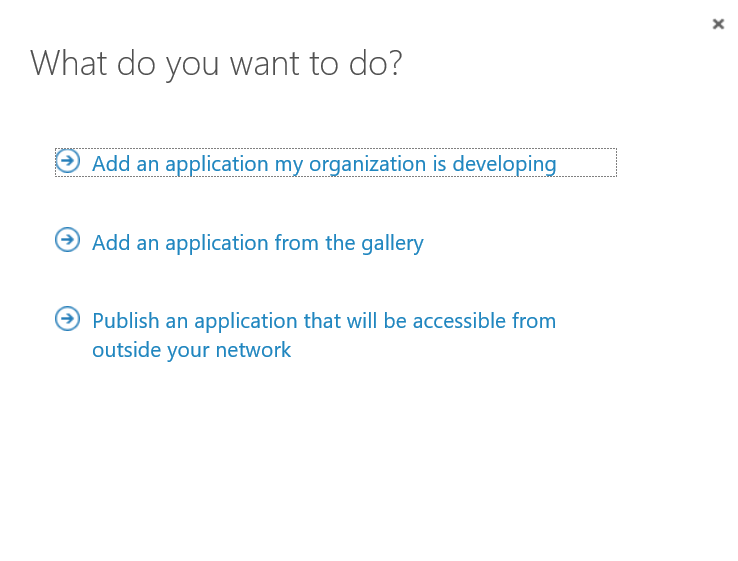 You will need to have an OMS Workspace for the Azure Subscription, and have a Hybrid Worker set up that can communicate with the Azure AD Connect Server. The Hybrid Worker will use a credential asset and variable asset created in the first part. In the following two parts I will look at these two requirements and how you can set it up to start triggering Azure AD Connect Scheduler with your Azure Automation Runbook. To set up the Azure Automation part of the solution, I have created a GitHub Repository where you can deploy the solution directly from https://github.com/skillriver/Trigger-AzureADSyncScheduler. This repository contains the Azure Resource Manager deployment template and PowerShell script that you need to get started. 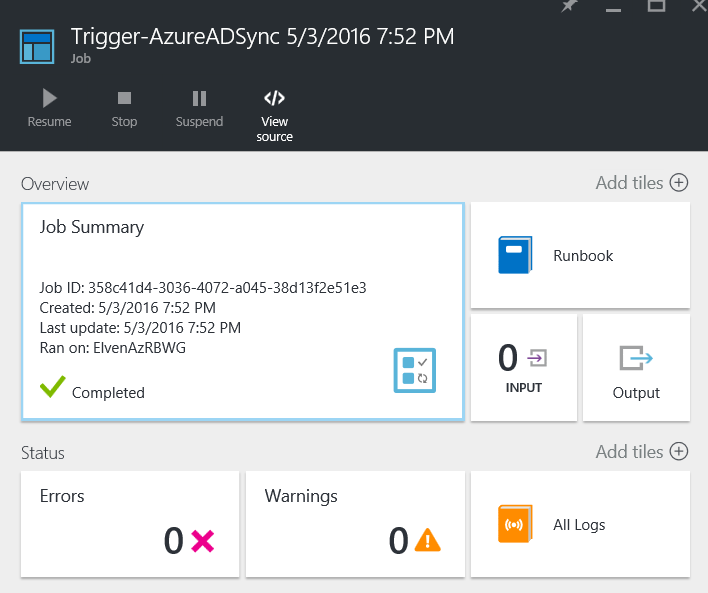 Lets step through what you experience when you click to “Deploy to Azure”. Please make sure that you are logged in to your correct Azure Subscription first. I will not go through how I created the ARM based JSON templates, but I will quickly show the user experience when doing the deployment. AUTOMATIONACCOUNTNAME. If you specify an existing Automation Account, this will be used, or else a new one will be created with the Free pricing tier. AAHYBRIDWORKERCREDENTIALNAME. There is a default value there, this will be used as a Credential Asset in the PowerShell script. You can change the value, but then you must remember to change it in the script as well. AAHYBRIDWORKERDOMAIN. The NETBIOS Domain Name for where the Azure AD Connect Server belongs to. AAHYBRIDWORKERUSERNAME. This is this the user name for the service account or other user account that has permission to connect to the Azure AD Connect Server and trigger the sync schedule. AAHYBRIDWORKERPASSWORD. The password for the user above. AADSSERVERNAME. The server name of the Azure AD Connect Server. You will have to select the correct subscription, and either create a new Resource Group, or an existing one (please note that Azure Automation is not available in every region). After saving the parameters, and reviewing and accepting legal terms, you are ready to create the custom deployment. 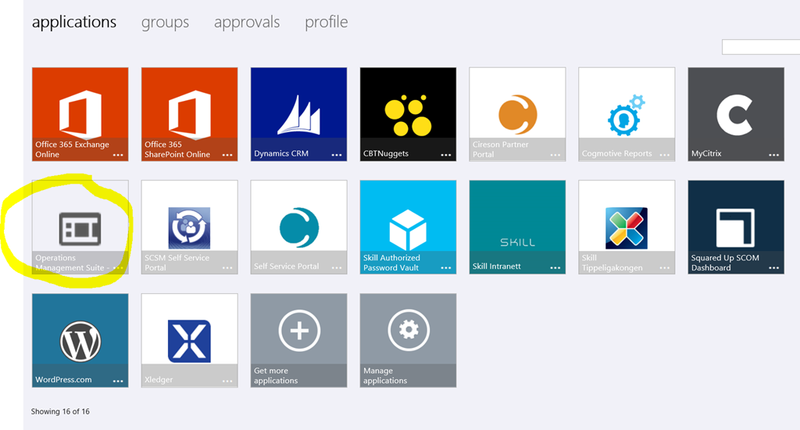 Create a Azure Automation Account (Free tier, and in your chosen supported Azure Region). Create a Variable Asset, with the name of the Azure AD Connect Server. 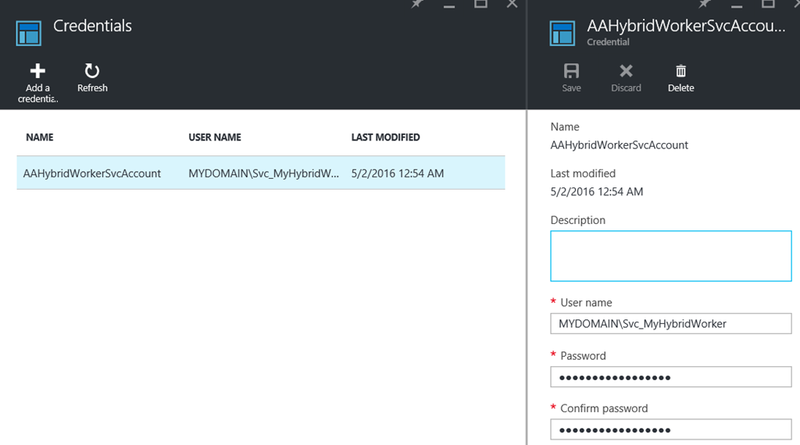 Create a Credential Asset, with the DOMAIN\UserName of the account you will use to remote session to the Azure AD Connect Server. Create a new PowerShell Script Runbook, typing the CmdLets from above and using your variable assets. By now you should be ready for the next step, because you cannot run this Automation Runbook just yet. You have to have in place OMS and a Hybrid Worker first, and that will be shown in the next part. 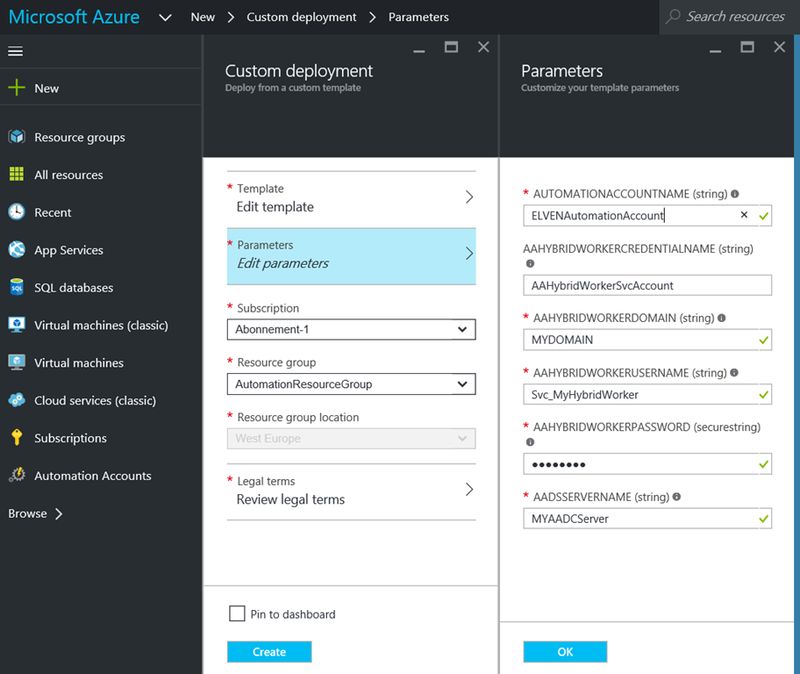 To be able to run Azure Automation Runbooks in your own datacenter, you will need to have an OMS workspace and at least one Hybrid Worker configured that will be able to execute the Runbook locally and connect to the Azure AD Connect Server. 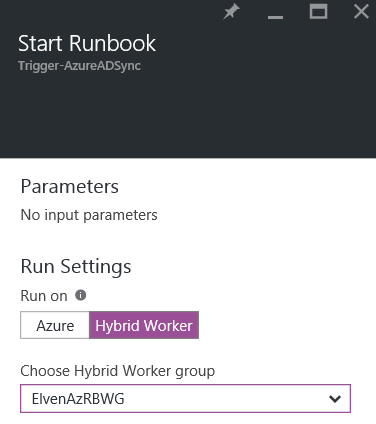 I will not go through the details here on how to set up an OMS workspace and a Hybrid Worker if you don’t have this from before, you can just follow the documentation here https://azure.microsoft.com/en-us/documentation/articles/automation-hybrid-runbook-worker/. 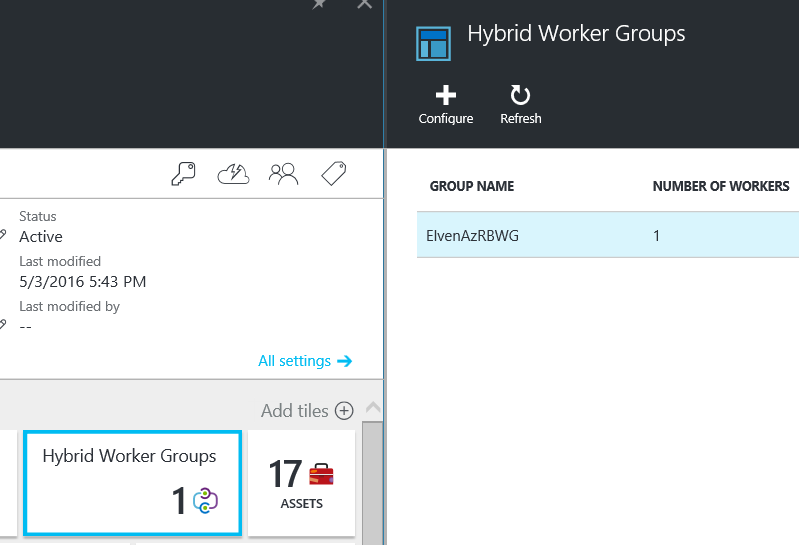 After setting up and registering your Hybrid Worker, you will have a Hybrid Worker Group with at least one Hybrid Worker. That should be it, we are now ready to start the Runbook and verify that it works. That concludes this blog article, hope it has been helpful! This entry was posted in Automation, Azure, PowerShell and tagged Azure, Operations Management Suite, PowerShell on May 3, 2016 by Jan Vidar Elven. Following up on my previous blog article on how to collect Service Manager and Incident statistics via Operations Manager to OMS, https://systemcenterpoint.wordpress.com/2016/02/19/collecting-service-manager-incident-stats-in-oms-via-powershell-script-performance-collection-in-operations-manager/, this blog article will show how to get statistics for Service Requests and display that as Performance Data in OMS. Please see the link above for the first article on getting SCSM data to OMS, and instructions for configuring your Operations Manager environment and SMLets PowerShell module. I will use that same setup as basis for this article. Now, first some thoughts on why I chose these data to get for Service Requests (SR). When New Service Requests are created, they are quickly changed to a status of either Submitted (no activities in the template the Service Request was created from) or In Progress (where there are one or more activities). SR’s with no activities are manually set to Completed by the analyst when finished, or Cancelled if the SR will not be delivered. SR’s with activities gets the status Completed when all activities are completed as well, but might also get the status of Failed if any activities fails as well, for example runbook automation activities that might fail. Finally, when SR’s are completed, they will eventually be Closed. So it makes sense to track all these statuses as performance data. You might ask why look at New status for SR’s, when this is only an intermittent status quickly changing to either Submitted or In Progress? Well, if there is a problem with the Workflow service at the Service Manager Management Server, SR’s can be stuck in New status. This is something I would want to be able to see in OMS, and even create an Alert for. In addition to tracking the individual status values, I also want to see data on how many SR’s are created the last day, last hour, and also how many SR’s are Completed the last day. These will be nice performance indicators. In Log Search, I can specify Type=Perf ObjectName=ServiceMgrServiceRequestStats, and I will find the Results and Metrics for the specified time frame. I can now look at Service Manager stats as performance data, showing different scenarios like how many active, pending, resolved and closed incidents there are over a time period. I can also look at how many incidents are created by each hour or by each day. A couple of scenarios are interesting for Alerts when some of the Service Request counters pass a threshold. Failed Service Requests is a status that will be set when an Activity in the SR fails, for example a Runbook Automation Activity. Normally you would expect that analysts would follow up on requests that fails directly in Service Manager, but it could make sense to generate an alert if the number of failed requests increases over a predefined threshold. There is also a second scenario for an alert, and that is when Service Requests get stuck in a New status. Normally this would be when Service Manager workflows are not running, so it will be important to get notified on that. This entry was posted in Log Analytics, Operational Insights, Operations Manager, Operations Managment Suite, Service Manager and tagged Log Analytics, Operational Insights, Operations Management Suite, Operations Manager, PowerShell, Service Manager on February 24, 2016 by Jan Vidar Elven. I have been thinking about bringing in some key Service Manager statistics to Microsoft Operations Management Suite. The best way to do that now is to use the NRT Performance Data Collection in OMS and PowerShell Script rule in my Operations Manager Management Group that I have connected to OMS. The key solution to make this happen are the “Sample Management Pack – Wizard to Create PowerShell script Collection Rules” described in this blog article http://blogs.msdn.com/b/wei_out_there_with_system_center/archive/2015/09/29/oms-collecting-nrt-performance-data-from-an-opsmgr-powershell-script-collection-rule-created-from-a-wizard.aspx. With this solution I can practically get any data I want into OMS via SCOM and PowerShell Script, so I will start my solution for bringing in Service Manager Stats by defining some PowerShell commands to get the values I want. For that I will use the SMLets PowerShell Module for Service Manager. For this blog article, I will focus on Incident Stats from SCSM. In a later article I will get in some more SCSM data to OMS. Install the SMLets for SCSM PowerShell Module (at the chosen Target server for the PowerShell Script Rule). Regarding the SMLets and where to install, I decided to use the SCOM Root Management Server Emulator. This server will then run the SCSM commands against the Service Manager Management Server. I also needed to think about the run as account the SCSM commands will run under. As we will see later the PowerShell Script Rules will be set up with a Default Run As Profile. Alternatively, I could have created a custom Run As Profile with a SCSM user account that have permissions to read the required data from SCSM, and configured the PowerShell Script rules to use that. Some comments about the script. I usually like to include some debug logging in the script when I develop the solution. This way I can keep track of what happens underway in the script or get some exceptions if the script command fails. Be aware though that doing $ErrorActionPreference=Stop will end the script if any errors, so it might be an idea to remove the debug logging when confirmed that everything works. Looking into the Properties of the rules, we can make edits to the PowerShell script, and verify that the Run as profile is the Default. This is where I would change the profile if I wanted to create my own custom profile and run as account for it. In Log Search, I can specify Type=Perf ObjectName=ServiceMgrIncidentStats, and I will find the Results and Metrics for the specified time frame. Finally, I can also create saved searches and alerts that creates for example alerts when the number of incidents for any counters are over a set value. This entry was posted in Operations Manager, Operations Managment Suite, PowerShell, Service Manager and tagged Azure, Log Insights, Operations Management Suite, Operations Manager, PowerShell, Service Manager on February 19, 2016 by Jan Vidar Elven. 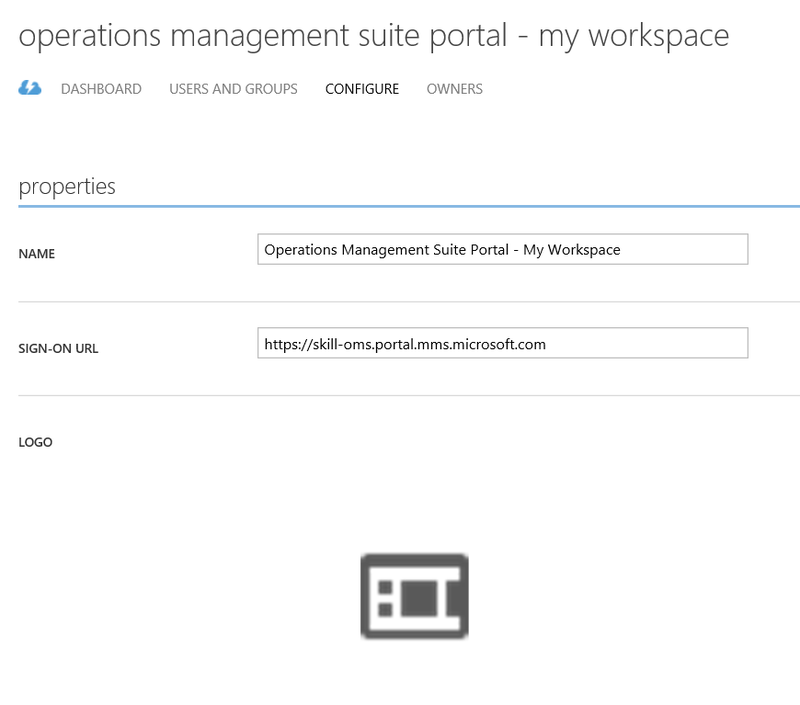 To be able to access the Operations Management Suite Portal for your OMS workspace, you will need to have an account with either administrator or user access to the workspace. 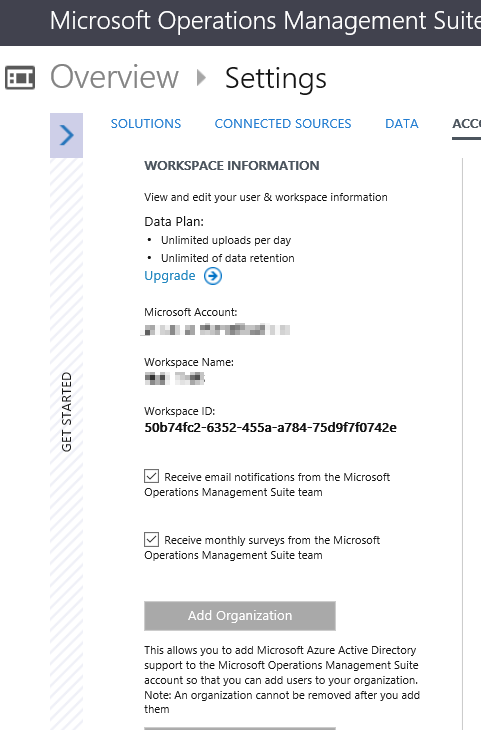 This could be a Microsoft Account, or if you have added an Azure Active Directory Organization to your OMS workspace, you can add Azure users or groups to your workspace. 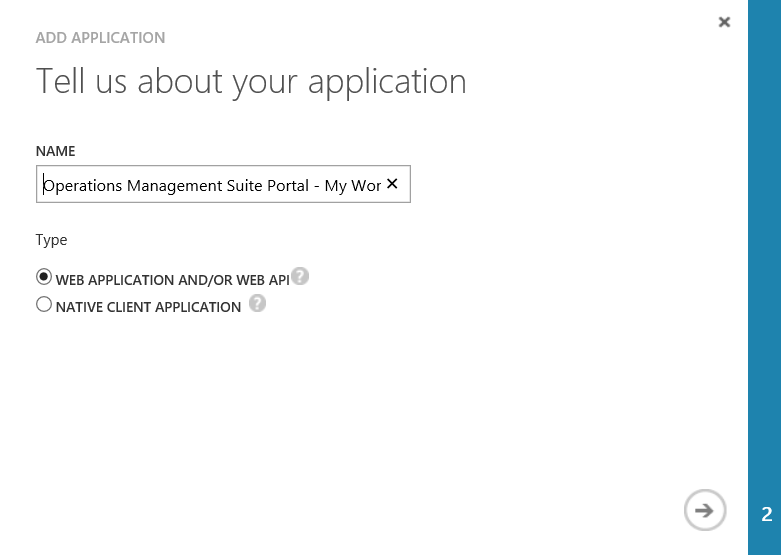 When users from your Azure AD has been granted either administrator or user access to the OMS workspace, you can notify them that they can log on to the portal. But, where should they go to log in? 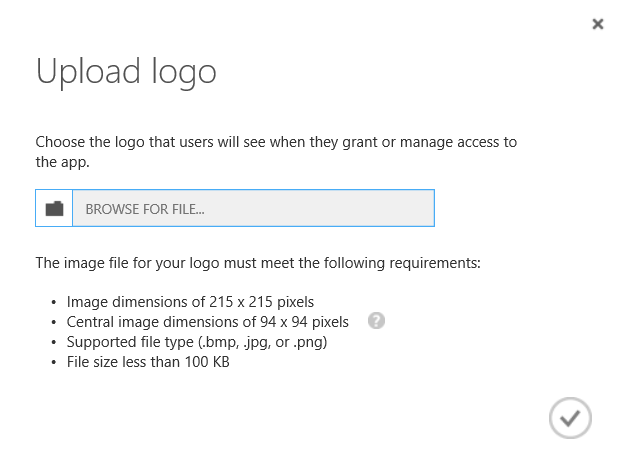 The simplest way could be to tell them to go to http://www.microsoft.com/oms, and hit the Sign In link at the top. After signing in they will be instructed to choose the OMS workspace and then be directed to the OMS portal. You will find the Workspace ID under Settings, and sometimes you can also use the Workspace Name in the above URL as well. So you can communicate to users in your organization one of the methods above on how to access the portal. Chances are that most users will forget this info after a short while. They will either search after your e-mail, or ask you again at some time. 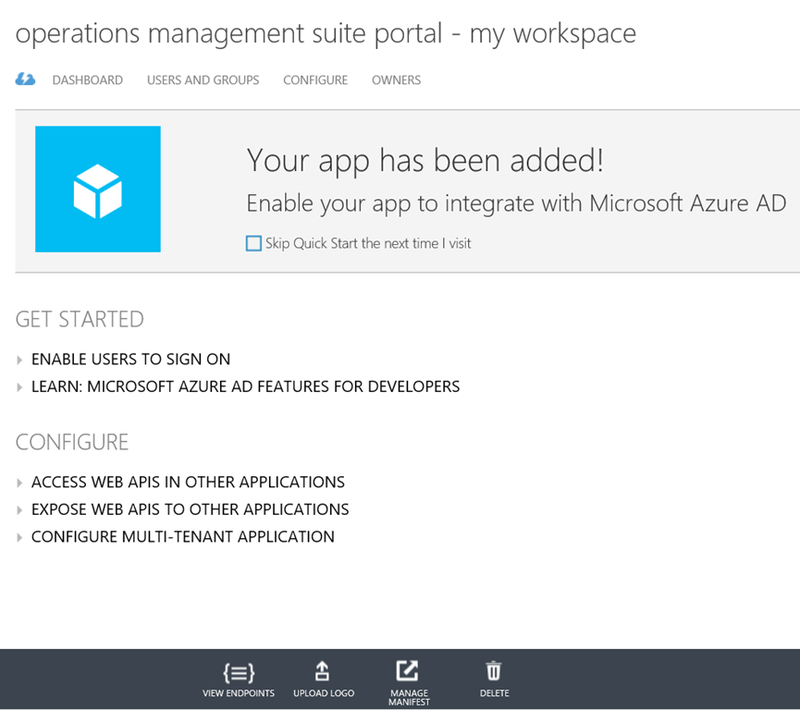 In this blog post I will show how you can publish the Operations Management Suite Portal as an Azure AD Application, utilizing Single Sign-On, so that users can access it easily with My Apps or the App Launcher in Office 365! Next I need to add which Users or Groups that will see the published application. At the Users and Groups page for my application, I’m notified that user assignment are not currently required to access Operations Management Suite Portal. 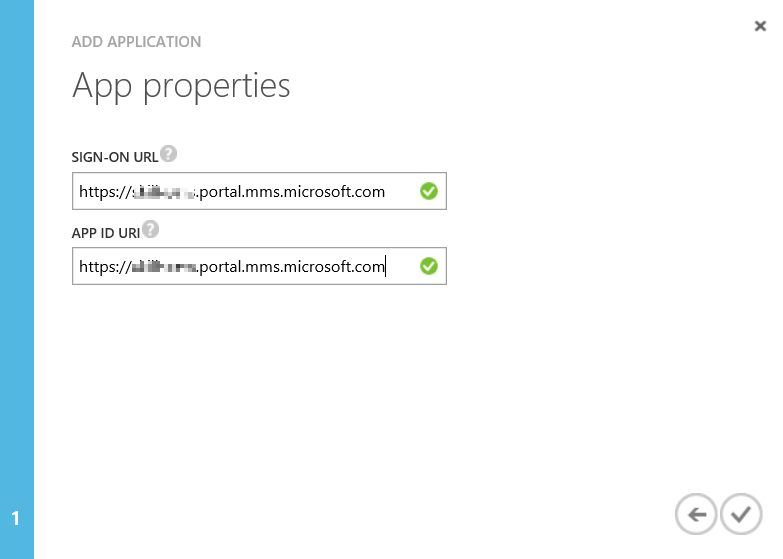 That is correct, because users can access the portal directly if they know the URL or sign in at the Microsoft OMS site. I search for and select to Assign the Groups (or Users) I want to have the application visible for. After adding users, the application is ready to test, but first I would want to add my own logo. 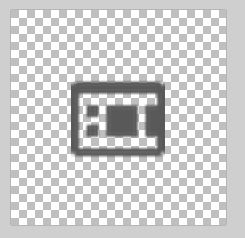 In this example I’m using a transparent png image with dimensions 215×215, and a central image dimension of 94×94. At the Configure page, other settings can be set such as requiring user assignment, access rules with Multi-Factor Authentication and Self-Service access for users that has not been specifically assigned access. I this scenario I only wanted to get the application published to users, so I will not configure any more settings. We are ready to test. 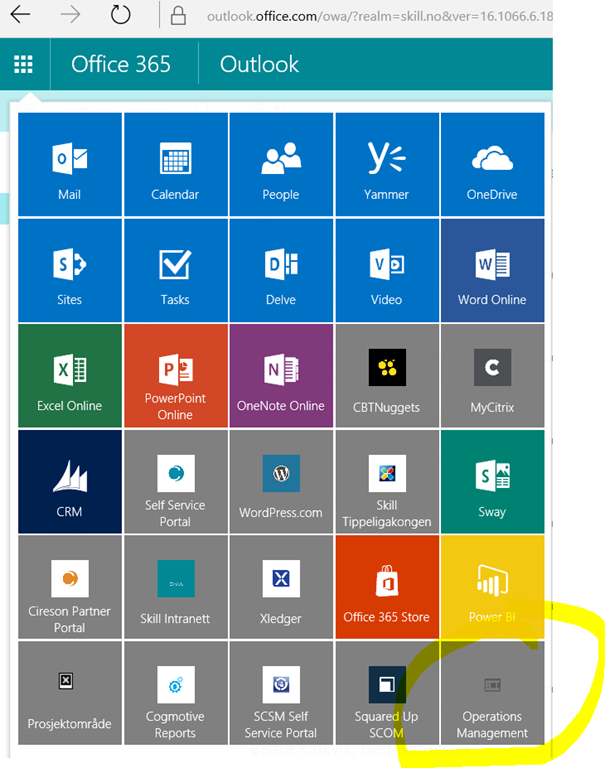 And, logged in to Office 365, I can select the App Launcher and show all my apps at https://portal.office.com/myapps. I can pin the application to the App Launcher if I want for quicker access. So to conclude this blog post, users now have a quickly accessible shortcut to the Operations Management Suite Portal using single sign-on with Azure AD. This entry was posted in Azure, Azure AD, Enterprise Mobility Suite, Operations Managment Suite and tagged Azure AD Premium, Enterprise Mobility, Operations Management Suite on January 21, 2016 by Jan Vidar Elven. This is the second part of a 2-part blog article that will show how you can create a new Service Manager Incident from an Azure Automation Runbook using a Hybrid Worker Group, and with OMS Alerts search for a condition and generate an alert which triggers this Azure Automation Runbook for creating an Incident in Service Manager via a Webhook and some contextual data for the Alert. In Part 1 of the blog I prepared my Service Manager environment, and created Azure Automation Runbook and Assets to run via Hybrid Worker for generating incidents in Service Manager. In this second part of the blog I will configure my Operations Management Suite environment for OMS Alerting and Alert Remediation, and create an OMS Alert that will trigger this PowerShell Runbook. The next step is to create the OMS Alert. To do this I will need to do a Log Search with the criteria I want. For my example in this article, I will use an EventLog Search where I have previously added Azure AD Application Proxy Connector Event Log to OMS, and where I also have created a custom field for events where “The Connector was unable to connect to the service due to networking issues”. When I enabled OMS Alerting and Remediation under Settings, I can now see that I have a new Alert button at the bottom of the screen. I click on that to create my new OMS Alert. I give the OMS Alert a descriptive name, using my current search query, and checking every 15 minutes for this alert. I can also specify a threshold over a specified time windows, in this case I want the Alert to trigger if there are more than 0 occurrences. If I want to I can also send an email notification to specified recipient(s). Since I want to generate a SCSM Incident when this OMS Alert triggers, I select to Enable Remediation and select my Create-SCSMIncident Runbook. That is all I need to configure in Operations Management Suite to get the OMS Alert to trigger. Now I need to go back to the Azure Portal and configure some changes for my PowerShell Runbook! In the Azure Portal and under my Automation Account and the PowerShell Runbook I created for Create-SCSMIncident (see Part 1), there will now automatically be created a Webhook for OMS Alert Remediation. This Webhook has a expiry date of one year ahead of creation. After I have specified the Hybrid Worker group, any OMS Alerts will now trigger this Runbook and run on my local environment, and in this case create the SCSM incident as specified in the PowerShell Runbook. But, I also want to have some contextual data in the Incident, so I need to look at the Webhook data in the next step. Whenever the OMS Alert triggers the remediation Azure Automation Runbook via the Webhook, event information will be submitted from OMS to the Runbook via WebhookData input parameter. So, I need to configure my PowerShell Runbook to process this WebhookData, and to use that information when creating the Incident. In this case I want the Source, EventID and RenderedDescription, which also corresponds to the values from the Alert in OMS, as shown below. I then use these values for the Incident Title and Description in the PowerShell Runbook. After publishing the updated Runbook I’m ready for the OMS Alert to trigger. That concludes this two-part blog article on how to create SCSM Incidents from OMS Alerts. OMS Automation rocks! This entry was posted in Automation, Operations Managment Suite, PowerShell, Service Manager and tagged Automation, Azure, Operations Management Suite, PowerShell, Service Manager on December 8, 2015 by Jan Vidar Elven. There has been some great announcements recently for OMS Alerts in Public Preview (http://blogs.technet.com/b/momteam/archive/2015/12/02/announcing-the-oms-alerting-public-preview.aspx) and Webhooks support for Hybrid Worker Runbooks (https://azure.microsoft.com/en-us/updates/hybrid-worker-runbooks-support-webhooks/). This opens up for some scenarios I have been thinking about. This 2-part blog will show how you can create a new Service Manager Incident from an Azure Automation Runbook using a Hybrid Worker Group, and with OMS Alerts search for a condition and generate an alert which triggers this Azure Automation Runbook for creating an Incident in Service Manager via a Webhook and some contextual data for the Alert. This is the first part of this blog post, so I will start by preparing the Service Manager environment, creating the Azure Automation Runbook, and testing the Incident creation via the Hybrid Worker. First I want to prepare my Service Manager Environment for the Incident creation via Azure Automation PowerShell Runbooks. I decided to create a new Incident Source Enumeration for ‘Operations Management Suite’, and also to create a new account with permissions to create incidents in Service Manager to be used in the Runbooks. The next step is to prepare the account for the Runbook. 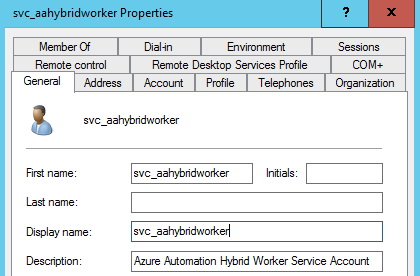 As Azure Automation Runbooks on Hybrid Workers will run as Local System, I need to be able to run my commands as an account with permissions to Service Manager and to create Incidents. I elected to create a new local Active Directory account, and give that account permission to my Service Manager Management Server. Adding the account to the Advanced Operators group is more permission than I need for this scenario, but will make me able to use the same account for other work item scenarios in the future. With the Service Manager Enviroment prepared, I can go to the next step which is the PowerShell Runbook in Azure Automation. I also have created a variable for the SCSM Management Server Name to be used in the Runbook. The script should be pretty straightforward to interpret. The most important part is that it would require to be run on a Hybrid Worker Group with Servers that can connect via PowerShell Remote to the specified Service Manager Management Server. The Incident that will be created are using a few variables for incident title and description (these will be updated for contextual data from OMS Alerts in part 2), and some fixed data for Urgency, Impact and Status, along with my custom Source for Operations Management Suite (ref. the Enumeration Value created in the first step). After publishing this Runbook I’m ready to run it with a Hybrid Worker. Now I can run my Azure Automation PowerShell Runbook. I select to run it on my previously defined Hybrid Worker Group. That concludes this first part of this blog post. Stay tuned for how to create an OMS Alert and trigger this Runbook in part 2! This entry was posted in Automation, Operations Managment Suite, PowerShell and tagged Automation, Azure, Operations Management Suite, PowerShell, Service Manager on December 8, 2015 by Jan Vidar Elven.